Fine Gael is currently the largest political party in the Oireachtas (Ireland’s parliament). The Ard Fheis is an annual event for party members and took place in 2014 at the RDS conference centre in Ballsbridge, Dublin. 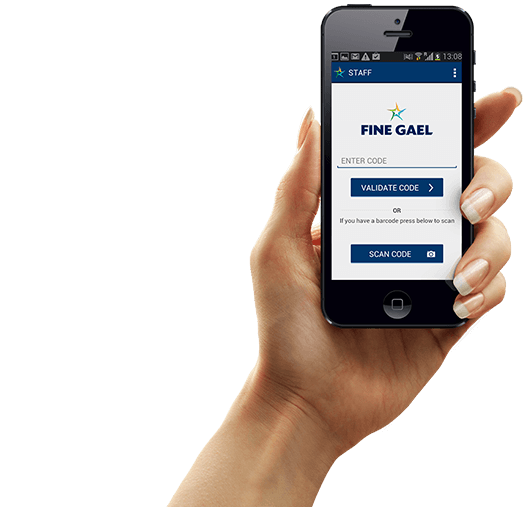 Fine Gael wanted to put in place a secure registration and mobile ticketing validation solution to ensure that only current members could attend and to encourage non-members to join. Another objective was to enable the checking and updating of membership details during the registration process, enabling members to edit and add to their own details during registration. The organisation also wanted to have full visibility on numbers for health and safety reasons so that the maximum number of delegates was not exceeded. Púca adapted its ‘smart codes’ platform to provide a custom attendee registration and ticketing solution for the event. This included a secure online pre-event registration website, issuing of tickets and validation of tickets at the event through both desktop and smartphone scanning. All delegates attending the Ard Fheis had to register for the event website by entering their Membership Number and Surname, and then following the brief instructions on screen. Registration details were validated in real-time against the Fine Gael member database. After member validation an additional screen asked users if their address details were correct and also captured additional membership information including day of attendance, email address, mobile, Facebook and Twitter usernames. SMS registration was also provided as an additional option for members who preferred this method. To register by SMS members simply texted FG, followed by their Membership Number and Surname to a standard rate shortcode, 51500. Once a delegate had registered by SMS they received an acknowledgement text asking them to confirm whether they would attend on the first day, the second day, or both. Púca also provided on-the-day attendee registration and ticket validation using its platform. Unique “smart codes” were included in the tickets which were scanned at registration and cross-referenced with the person’s membership pass for additional security. To speed up the registration process at the event Púca provided a mobile ticketing scanner app which was downloaded to staff’s mobile devices and could be used in addition to the standard handheld scanners. The fully digital solution ensured a secure registration process, while also helping speed up the ticketing redemption process and providing full visibility on numbers at each day of the event. Membership details were validated and/or updated for a large proportion of attendees ensuring that the membership database was kept up to date. The mobile scanner app proved a great success as it meant that additional smartphones could be deployed as scanners on the day to help speed up throughput. Everything went very smoothly, and we’d be pleased to work with Púca again.